We begin our Journey to the Everest High Passes Trek Via Chhukung with a sightseeing day in Kathmandu which offers a brief exploration of the temples, shrines, bazaars and restaurants of Kathmandu. We take a stimulating mountain flight to Tenzing-Hillary Airport at Lukla on the following day followed by trek up through the classic route to the Sagarmatha National Park playing with mighty Dudh Koshi river, colorful landscapes, Gompas and monasteries in the land enclosed by the soaring peaks. After reaching the summit of Kongma La, as we compose our way to the Everest Base Camp we marvel at the spectacle of Khumbu icefall cascading from the Western Cwm. Our trek to the view point of Kalapatthar is followed by the tough climb through Cho La that finally takes us to the cobalt-blue lakes at Gokyo. After enjoying a inspiring views from the fifth lake and Gokyo Ri, we make our way to the next great pass, the Renjo La. Making a night in Marlung we follow a little of the route used for centuries by the Tibetan Traders via Nangpa La to get to Thame. Following the classical route, we drop down to Lukla and fly back to Kathmandu leaving behind our foot prints in the shadow of the Everest. The walk is pleasant as we leave Dingboche through stone walled fields and alpine landscape. We take the trial from Dingboche through Imja Khola valley to land raven by glacier moraines amidst towering formidable mountains. We walk leisurely as our schedule for today is only 3-4 hours trek. While walking through the valley, Lhotse towers on our left and Ama Dablam on our right. After walking about 3 km, we reach at yak herdman place called Bibre. Straight ahead, beyond a terminal moraine wall, soars the Island peak (Imja Tse), a most popular trekking peak. The pyramidal Imja Tse looks awesome with its step rocky and-icy south face. The trail ahead is intersected by icy streams. We reach Chhukung in about half an hour from Bibre. There are glaciers and massive snowy mountains all around the place. 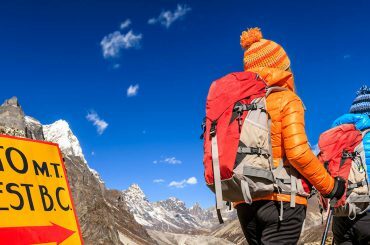 We might choose to hike to the rocky knoll of Chhukung Ri which offers stunning views of Lhotse, Island Peak, Ama Dablam, Makalu and several others including Baruntse. One of the hardest and longest day as today is our first pass of our trip. Khongma-la which is 5535m can be very difficult with lots of snow in fact it can be impossible to cross with heavy snow on it. Leave very early this morning after an early breakfast. Cross the small stream behind Chukung and slowly start climbing up through the landslide area and slwoly it gets steeper until you come to the grassy hill from where Dingbuche and Tyangbouche is visible. The trails gets bit easier now from now for a while and soon again another very steep path is ahead of you until you come to the ridge from where small lake is seen and later a very big lake is infront of you with the view of so many mountains. last half and hour walk from the lake is quite steep and a bit of scrambling to the top of the pass at Khongma-la. Its worth while getting here as its our first pass and the view is superb from where you can see Lobuje where you are going and many mountains on both side of the pass including some of the montains is the Tibet as well. Descending is harder than ascending so be very careful and stay with your guides and listen to them. An hour walk on the boulders and later on scree all the way to the bottom of the pass. You are not done yet as the last bit is yet to come which is the sting in the tail as you have to clmb up to the moraine and then walk through the famous Khumbu glacier for another hour to Lobuje. We can see Kalapather, Everest base camp with many mountains and the sunset on Nuptse from our lodge is not to be missed. Today is the climax of our trip. We start early in the morning to catch the dramatic views from Kala Patthar witnessing the first light of day shining on Mount Everest. However, we need to get prepared for an early morning, dark and cold temperature departure beforehand. Further, there is always the potential for chilly wind which is quite common. 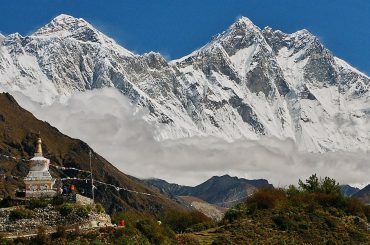 Familiar peaks such as Lingtren, Khumbutse, Changtse tower to the east even as Everest begins to reveal itself emerging between the west shoulder crest and Nuptse. During the ascent to Kala Patthar, we can pause to catch our breath at several outstanding view points to snap pictures. After several hours of an ascent, we reach Kala Patthar. From this juncture, we scramble to climb the rocky outcrop near to the summit marked by cairns and prayer flags. As we reach the top, we sit on the Kala Patthar where rocks our eyes taking unbelievable Himalayan Panorama, wandering from one mighty massif to another. We take as many pictures as we can and take the in view with our mind’s eye to last lifetime.And back to gorakshep. After breakfast we set off to Lobuche, where we stop for lunch. We then follow the Lobuche Khola downstream where, after a while, we take a trail to the right heading off towards Dzongla. Upon arrival we settle into our lodge and prepare for the crossing of the snowfields that lead to the top of Cho La (Pass). The day begins very early in order to reach the top of the pass in the best possible conditions. From camp we ascend steeply on a narrow trail passing large boulders and huge rock slabs and keeping to the left of the main glacier. There are a number of cairns lining the route to the snowfield and, while the trail is well-defined, it does involve a little scrambling. Once on the snowfield the angle eases off and we soon reach the top of the Cho-la pass (5420m), where the views are spectacular and include Baruntse (7220m) and Ama Dablam, as well as a sea of lesser peaks. Do not wander around the snowfield as there are crevasses and we may need to rope up for the pass crossing! The descent from the pass is steep and care should be taken as we follow the narrow rocky trail down to the Nymagawa Valley, where we enjoy a packed lunch. From the valley we cross rocky scree and boulders and ascend the short distance to a small saddle that leads downhill all the way on an easy trail to the huts and tea houses at Thangnak. We head off towards the Ngozumba Glacier where we do a touch of boulder hopping as we pass small glacial lakes. The views are astounding as we enjoy different views of the Gokyo Valley as Cho Oyu and adjacent mountains bordering Tibet loom to the right. The trail then reaches the second lake of Gokyo, where we can see Brahminy ducks swimming in pairs and feeding on algae. From the second lake it takes another 45 minutes to reach the settlement of Gokyo where we spend the night. We have lunch at Gokyo and then have the afternoon to relax and rest. If feeling well-acclimatised there is an option to head off to Gokyo Ri in the afternoon for spectacular sunset views. 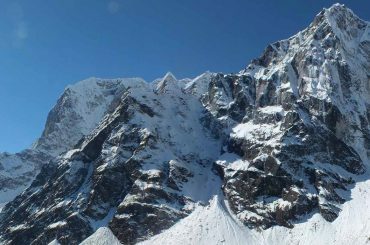 It is a steady climb to the top of Gokyo Ri and takes about 2½ hours to reach the top. Though it is hard work but in the end we are rewarded with an unsurpassable 360-degree of views of four 8000-metre peaks – Everest (8848m), Cho-Oyo (8153m), Lhotse (8511m) and Makalu (8481m). There are countless other towering snow-capped peaks and rock spires fill the horizons including Gyachung Kang (7922m) to the east of Cho-Oyo, Cholatse (6440m), Taweche (6542m) and Kangchung (6103m). After spending time snapping breath-taking photos, we head back down to our lodge at the bottom. With the fading lights the descent can be tricky and our flashlights will come very handy. Early morning, we hike up to the Gokyo Ri (Gokyo Peak). Climbing to Gokyo Ri is obviously strenuous as it is steep up and takes about 3 to 4 hours to reach the top. 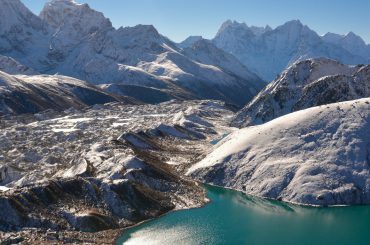 But even from the trial scenery of Gokyo village on the edge of third lake overlooked by Cholatse and the broad Nogzumpa Glacier are mind blowing. We feel like we are surrounded by panoramic mountains like Kusum Kanguru, Thamserku, Kangtega, Taboche, Cholatse, Makalu, Lhotse, Nuptse, Everest, Changtse, and Pumori. Sight of sunrays kissing the Everest that towers over all surrounding peaks is unlike from Kala Patthar (from Kala Patthar Nuptse seems taller). Our Gokyo Ri visit will be unforgettable life time memories.So,after we get back to the tea house in Gokyo,we have a late brunch and then spend the afternoon enjoying the lake view.Overnight at Gokyo. We have an early start as we have a long day ahead of us. The trail skirts around north of Gokyo Lake and then climbs up though scree slope as we reach a highland pasture. Looking back, we enjoy excellent views of Gokyo and the mountains in the background. We continue to climb on scree and also boulder hop towards Renjo La (Pass) (5420m). We finally reach the top of the pass, which is marked by prayer flags, from where we can have a look into Nangpa Valley and, looking back, we have views of Everest and Makalu. We stop at the pass to have our pack lunch and take a well deserved rest. The descent is tricky as we have to walk on scree and loose rocks (ropes are fixed in icy conditions to facilitate the descent). After a while we reach a glacial lake from where the valley opens up. We continue to head down the valley through open pastures for sometime before bearing left to reach the small settlement of Lungden, the main occupation of the people arond here is farming and catteling. We can also see the famour trading route bwtween Tibet and Nepal and from where the caravans from Tibet still comes to Namche for trading. To the right bottom of Lungden is a river from Tibet called Bhote Khosi. We have a late start and descend all the way, following the Bhote Kosi River downstream. We walk down Nangpa Valley, passing through small settlements to finally reach the village of Marlung, where we stop for lunch. From Marlung the trail continues to descend and undulate passing through the village of Taranga to reach Thami Og and then Thami Teng, the birth place of Tenzing Sherpa. Thame is quite a famous village with many Everest summiteers living here, including Appa Sherpa who has climbed Everest an incredible 22 times.After having our lunch there we slowly descend down to Namche.